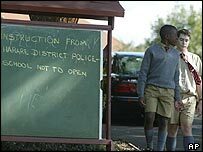 The authorities in Zimbabwe have closed down at least 45 private schools due to a dispute over school fees. Education Minister Aeneas Chigwedere said the schools had been closed because they increased their fees without government approval. "They throw Africans out simply by hiking fees," Mr Chigwedere said on state television. "We are dealing with racist schools. They are all former white schools, all racist." Notices have been placed on school gates informing parents and pupils of the closures and police officers are blocking the entrance to some schools. The state-run Herald newspaper reported that 30,000 pupils would be affected and listed the closed schools. One of President Robert Mugabe's sons and children of many ministers and ruling party leaders are believed to be among those turned away. The education minister said the schools would not reopen until they had complied with government regulations allowing them to increase their fees by only 10% a year. Some schools have proposed raising fees by about 50% to counter the impact of the rampant inflation, currently running at 580%. Some of Zimbabwe's most prestigious schools are charging tuition fees of up to 30 million Zimbabwe dollars ($5,635) per year. Before independence in 1980, Zimbabwe's best schools were reserved for whites. But according to the South African news agency, Sapa, the majority of pupils at Zimbabwe's private schools are now black. Although they are mainly from wealthier backgrounds, there are bursaries to allow poorer children to attend. "Things are bad enough here without being stopped from getting the best education for your child if you can afford it," one father told The Associated Press news agency as his daughter was turned away from school. In his independence day address on 18 April, President Mugabe also criticised the increase in fees for private schools. "Our principal goal of attaining education for all appears to be in real jeopardy with some schools charging as much as 10 million (Zimbabwe) dollars a term," the president said. "The government will soon come up with arrangements which will continue to make education accessible to each and every child regardless of his status or family background." But some observers say the government has allowed the country's education system to decline, after it was greatly expanded after independence. State-run schools in the country are reportedly in a critical condition - with many having classes of around 80 pupils. There is also said to be a shortage of teachers, textbooks, desks and classrooms. A recent survey by an International Monetary Fund research group, reported that school enrolment had declined by 60% in Zimbabwe last year because of fee hikes in both state and private schools.